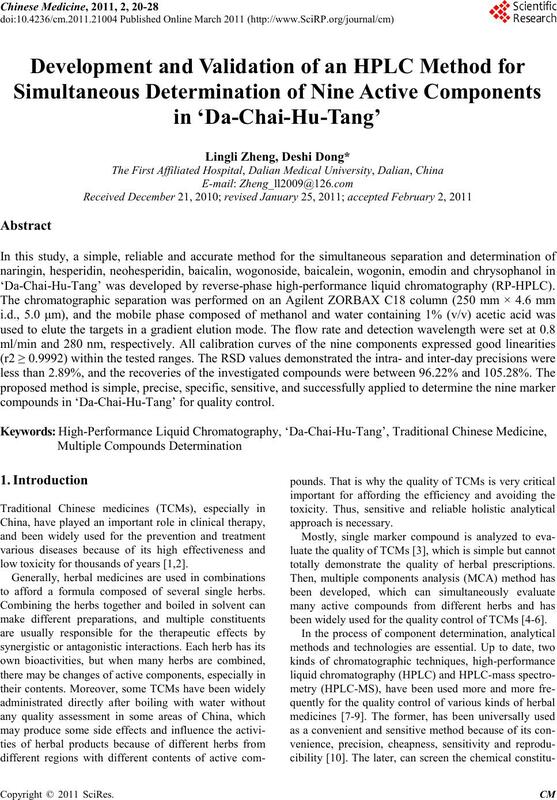 ‘Da-Chai-Hu-Tang’ was developed by reverse-phase high-performance liquid chromatography (RP-HPLC). compounds in ‘Da-Chai-Hu-Tang’ for quality control. low toxicit y for thousands of years [1,2]. to afford a formula composed of several single herbs. totally demonstrate the quality of herbal prescriptions. been widely used for the quality control of TCMs [4-6]. L. L. ZHENG ET AL. in inhibition atherosclerosi s and fatty liver [12,13]. and chrysophanol from R. paeoniae alba [25-29], etc. trol through a literature search as far as we known. for quality co ntrol by HPLC. filter (0.45 μm) before use. wogonoside; (6) baicalein; (7) wogoni n; (8) emodin and (9 ) chrysophano l.
dark brown calibrated flasks and stored at 4˚C. were prepared to validate the specificity of the method. to 80% A; 110-120 min, the linear gradient to 95% A.
and c hrysophanol, r espectively. critical i mporta nt for high extraction efficie ncy. Table 1. 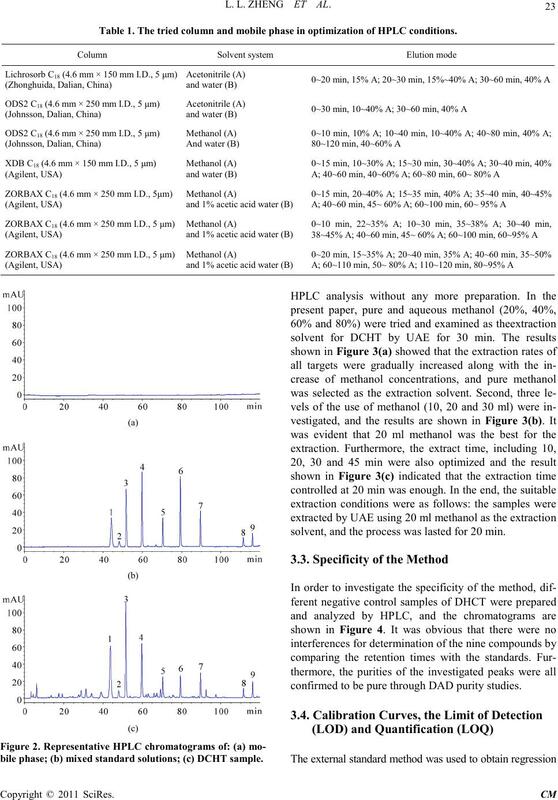 The tried column a nd mobile pha se in optimization of HP LC co nditions. 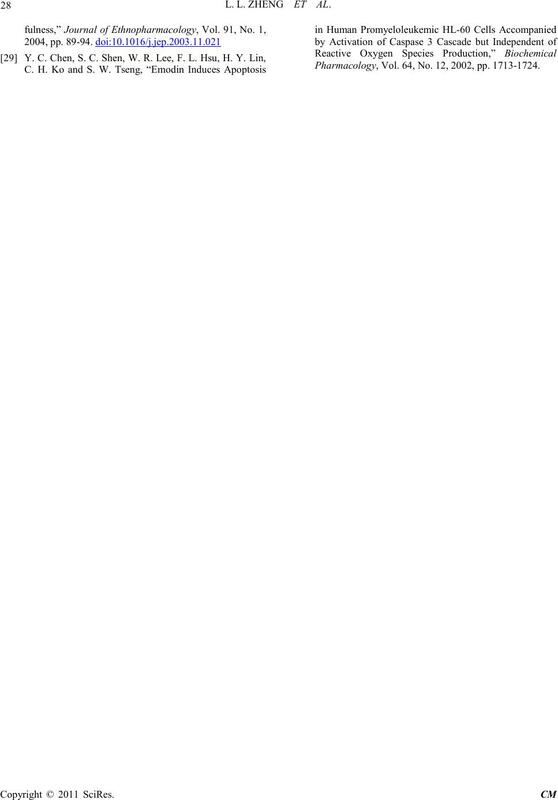 bile phas e; (b) mixed standard so lutions; (c) DCHT sample . solvent, and the pro cess was lasted for 20 min. confirmed to be pure through DAD purity studies . the use of methanol; (c) extraction time. without R.et Rhi zoma Rhei. equations. The calculated results are shown in Table 2. 0.35-0.87 µg/ml (listed in Table 2). Table 2. Regres sion data, linear range and the LOD a nd LOQ of the develope d method. detection, S/N＝3; cLOQ refers to the limit of quantification, S/N＝10. 2.15%). The results are listed in Table 4. Table 3. 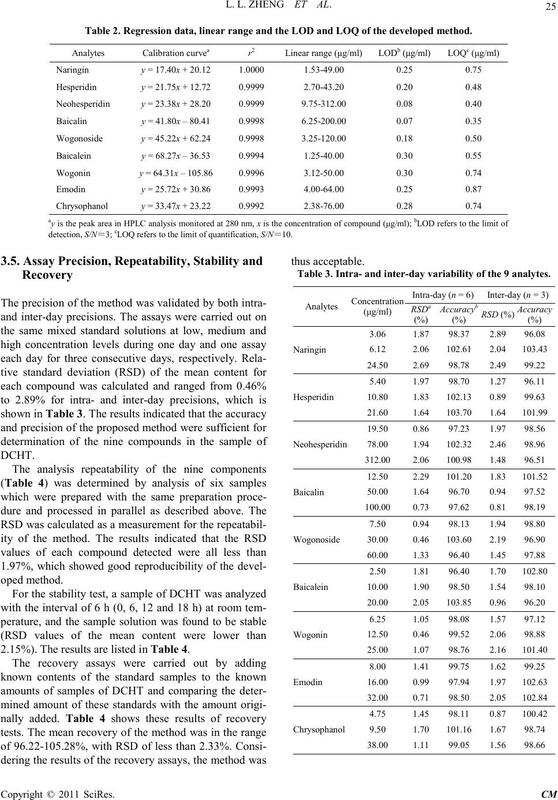 Intra- and inter-day variability of the 9 analytes. aRSD(%) = (SD/mean) × 100; baccuracy(%) = (mean of measured concen- tration/spiked concentration) × 100. Table 4. 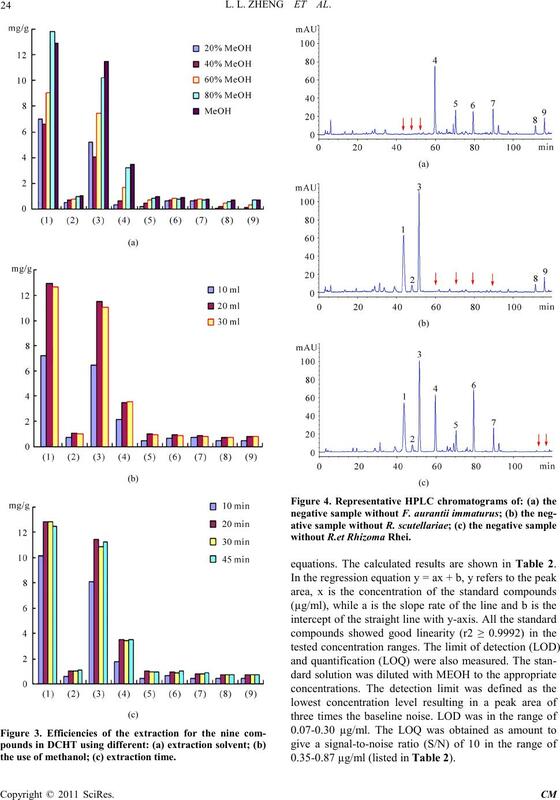 Rep eatbility, stability and recove ry results for the assay of the 9 analytes. aRecovery(%) = (detected amount − original a mount)/spiked amount × 100. Science and Technology Foundation of Dalian, China. 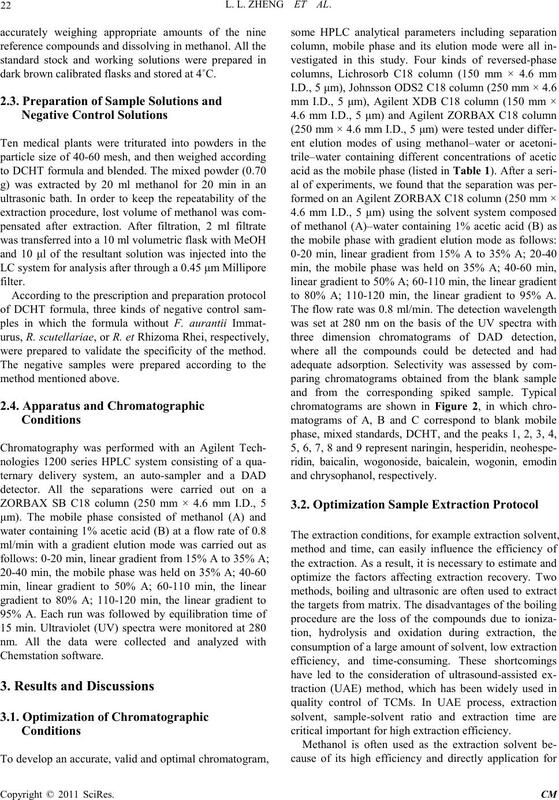 Leaves and Extracts,” Journal of Chromatography A, Vol. 967, No. 1, 2002, pp. 21-55. R. L. J. Gra h am, C . Gr a ha m, S . M. Clean, T. B. Chen, M.
Communications, Vol. 338, No. 3, 2005, pp . 1587-1592. 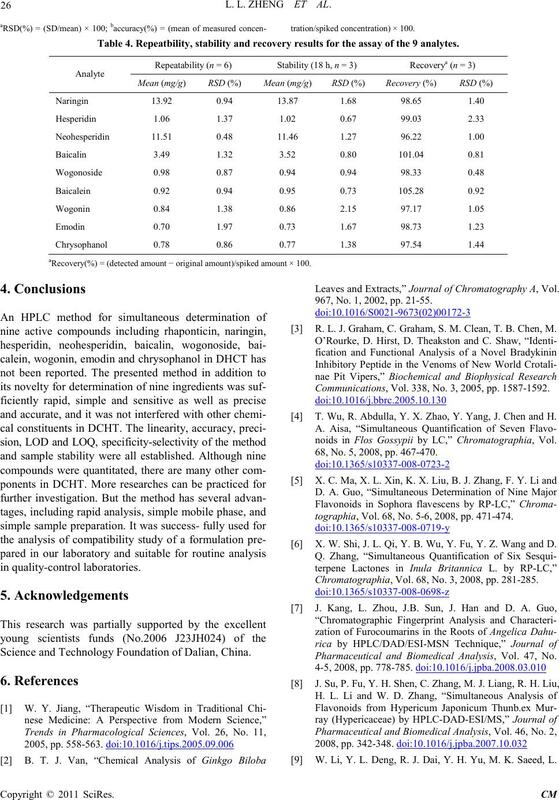 T. Wu, R. Abdulla, Y. X. Zhao, Y. Yang, J. Chen and H.
noids in Flos Gossypii by LC,” Chromatographia, Vol. 68, No. 5, 2008, pp. 467-470.
tographia, Vol. 68, No. 5-6, 2008, pp. 471-474. X. W. Shi, J. L. Qi , Y. B. Wu , Y. F u, Y. Z. Wang and D.
Chromatographia, Vol. 68, No. 3, 2 008, pp . 281-285. Pharmaceutical and Biomedical Analysis, Vol. 47, No. W. Li, Y. L. Deng, R. J. Dai, Y. H. Yu, M. K. Saeed, L.
and Biomedical Analysis, Vol. 45, No. 1, 2007, pp. W. Jin, R. L. Ge, Q. J. Wei, T. Y. Bao, H. M. Shi and P.
Vol. 28, No. 2, 2008, pp. 173-174.
of Ethnopharmacology, Vol. 63, No. 3, 1998, pp. 209-218.
rats,” Nutrition, Vol. 24, No. 5, 2008, pp. Vol. 587, No. 1, 2008, pp. 273-280. Vol. 106, No. 2, 2008, pp. 545-551. Pharmacology, Vol. 512, No. 2-3, 2005, pp . 189-198.
patotoxicity,” Toxicology, Vol. 226, No. 2-3, 2006, pp. 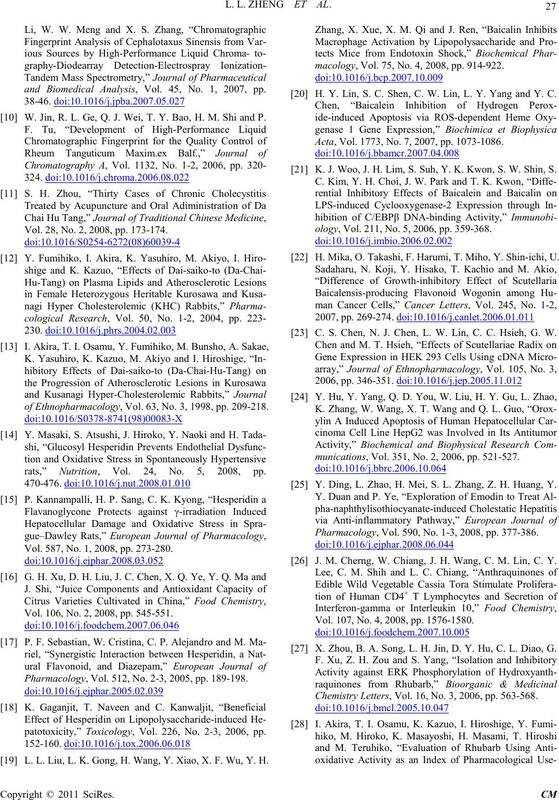 L. L. Liu , L. K. Gong, H. Wang, Y. Xiao, X. F. Wu, Y. H.
macology, Vol. 75, No. 4, 2008, pp. 914-922. H. Y. Lin, S. C. Shen, C. W. Lin, L. Y. Yang and Y. C.
Acta, Vol. 1773, No. 7, 2007, pp. 1073-1086. K. J. Woo , J. H. Lim, S. Suh, Y. K. Kwon, S. W. Shin, S.
ology, Vol. 211, No. 5, 2006, pp. 359-368. H. Mika, O. Takashi, F. Harumi, T. Miho, Y. Shin-ichi, U.
 C. S. Chen, N. J. Chen, L. W. Lin, C. C. Hsieh, G. W.
munications, Vol. 351, No. 2, 2006, pp. 521-527. 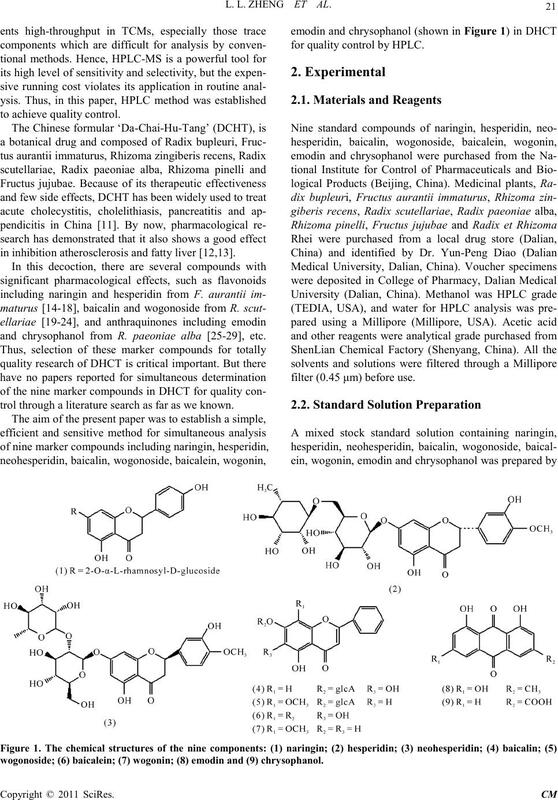 Y. Ding, L. Zhao, H. Mei, S. L. Zhang, Z. H. Huang, Y.
Pharmacology, Vol. 590, No. 1-3, 2008, pp . 377-386. J. M. Cherng, W. Chiang, J. H. Wang, C. M. Lin, C. Y.
Vol. 107, No. 4, 2008, pp. 1576-1580. X. Zhou, B. A. Song, L. H. Jin, D. Y. Hu, C. L. Diao, G.
Chemistry Letters, Vol. 16, No. 3, 2006, pp . 563-568. Pharmacology, Vol. 64, No. 12, 2002, pp. 1713-1724.